It was the fall of 1954. The international headquarters of Scientology in Phoenix, Arizona, was ablaze with activity. In the space of a few months, L. Ron Hubbard had delivered the 8th American Advanced Clinical Course, launched a series of weekly public lectures and Group Processing sessions and incorporated a new Hubbard Dianetics Research Foundation. And as if that were not enough, he was simultaneously writing the final chapters of a new book, Dianetics 55! Yet, above all, Mr. Hubbard’s researches during the previous year had been directed toward auditors—specifically, the training of auditors. 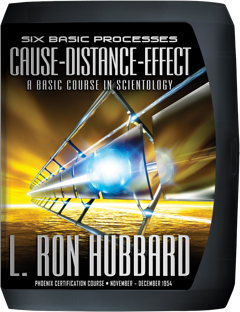 To that end, he had opened a Hubbard Professional College in Phoenix, which was now delivering its first Professional Course, designed to instill in students a full understanding and mastery of the six most basic processes of Scientology. It was called the Phoenix Certification Course. Running six days a week, the course included demonstrations from Instructors and co-auditing between students. Thus, on 16 November 1954, when L. Ron Hubbard stepped to the podium to deliver the first lecture, the predominant mood was one of excitement and anticipation. Soon the students were fully engrossed, for Mr. Hubbard wasted no time in relaying a startling new discovery: An inability to recall is caused by scarcity of past. Thus, the astonishing datum: Nobody in the last hundred thousand years had been able to remember at will anything on the time track. “You should realize that Elementary Straightwire does not mean remembering actual incidents. That’s a shock to you, probably. For as he elucidated, the auditor is recovering the preclear’s ability to be at Cause. Spotting Spots in Space—how it makes a preclear more capable of locating things and increases his ability. Moreover, as part of all he taught those auditors, Mr. Hubbard demanded their application of the knowledge and skills they had now acquired. To that end, they set out as ministers to visit hospitals, jails and people’s homes to bring the miracles of Scientology to the local community. It was called “Operation Phoenix” and miracles in abundance there soon were—from a woman abandoned by doctors who recovered from a severe hemorrhage, to a four-year-old boy scheduled for an operation to repair a withered arm whose limb was so restored after five hours of auditing that the operation was cancelled. Here, then, is what stands as a landmark on the road towards greater auditor certainty.